Looking for more options in bathware products? Mansfield Plumbing has added five new models to its PRO-FIT® Builder Series! The PRO-FIT line includes three different hydrotherapy systems: bathtub, whirlpool bath and air massage bath. The new 3666 OV and 3672 OV give builders two more choices for oval drop-in tubs. 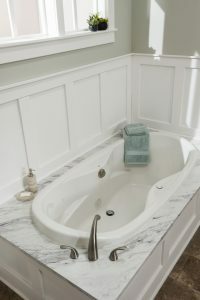 Each tub includes two back jets, end drain and the option of drop-in or undermount installation. Three new Tile Flange Skirt (TFS) tubs provide more options for alcove installation. The new 3060TFS NCA and 3260TFS NCA have an internal depth of 17 inches and have no contoured armrests, for a minimalist look. The two tubs include end drains, integral tile flange/apron and optional removable access panels. Finally, the 4272TFS features two flat front panels for simple access to the pump/motor along with integral tile flange/apron and armrests. New draining options for PRO-FIT tubs include a Tip Toe Drain that provides fast and easy draining by simply tapping the drain with your toe to open or close the drain. Or, an effortless twist operation is available with a Cable-Operated Drain. Both are available in Chrome, Brushed Nickel, Everbrass or Oil Rubbed Bronze. Finally, superior flush mount air injectors are now being used on PRO-FIT Air Massage Bath models, with air forced through the air injectors which are installed on the back wall of the tub. Each air injector has a check valve that prevents water from flowing back into the air line.